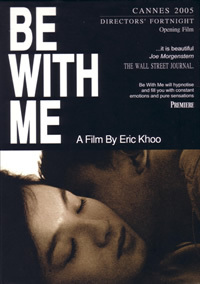 Opening film at Cannes Directors Fortnight 2005, Be With Me is a tapestry of love. The film is told through three different stories. Represented by young, middle-aged and old love, it deals with themes like longing, rejection and hope. Inspired by the life of Theresa Chan, Eric Khoo has conjured a powerful film that does not rely heavily on sound. Rather, he provided room for his actors to express their emotions through cooking, text messaging and letter writing. I must admit though that it became painful at one stage when the subtitling got a bit too much to take. Ezann Lee and Samantha Tan are the central characters in the young love part. The two get together after meeting in an online chat but Sam (Samantha Tan) starts distancing herself from Jackie (Ezann Lee) after a while. It pains to see Jackie being treated coldly by Sam, who herself is divided. Both girls are brilliantly captured in pensive mood. Seet Keng Yew plays a lonely security guard, Fatty who pines for Ann (Lynn Poh). Confined to loser-hood, we see his family’s treatment of him and how non-existent he really is in Ann’s life. Fatty tries to write a letter to Ann to profess his love but most of the time he ends up alone, indulging himself with food. In the old love part, Chiew Sung Ching plays an old shopkeeper who loves his sick wife and spends most of his time cooking for her and feeding her at the hospice. His story is intertwined with that of Theresa Chan’s through his son, a social worker played by Lawrence Yong. Look out for a very moving moment when the shopkeeper finally meets Theresa. Included in this DVD is the theatrical trailer of the film alongside a music video of a montage of the film. You’ll also be able to read more about the Be With Me Fund that has just been set up and will get a chance to view the storyboard of the film. There is a making of feature which can actually be found on the soundtrack of the film as well. This is the same making of that was shown on Mediacorp’s Arts Central not too long ago. It’s still great to watch though. The best bonus on this DVD has got to be the rehearsal footage. Its sad though that it clocks in at only eight and a half minutes. But if you thought Ezann and Samantha were hot, you would definitely enjoy this feature. Colours are splendidly used in Be With Me. In depicting the young love segment, Eric Khoo chose brighter colours to represent their courtship and soft tones to depict their love scenes. The middle-aged love is closely represented by illuminated street lamps and shopping mall lights. Bleak colours are also used to represent Fatty’s loneliness and despair which mostly occurs at home. As for the old love segment, tender colours are used and are tinted with grayish hues to represent a wiser and serene atmosphere.